What could be more exciting and unique than to stay in the central area of Baños Ecuador, facing the beautiful main square. We're located just around the corner from all the coffee shops, restaurants, clubs, bars and the Basilica. All our rooms are decorated with different local art paintings and photographs to give you a real Ecuador experience. You will find comfortable beds, power outlets, showers and bathrooms in all our rooms. There is no need to waste your day searching around for the best deal - We have it all here for you at reception. Let us do all the hard work, so you can enjoy your time in Baños!! You can book Baños day tours and other packages all around Ecuador, we have plenty of options to choose from. We're proud to offer our guests a safe and secure environment with our security camera system. Our property offers a variety of private rooms and shared dorms to perfectly accommodate your needs. Whether you are a family, a couple, solo traveler, or student group, you are guaranteed a cozy and affordable stay with access to all of the amenities we offer. Not only do we offer a strong WIFI connection to all of our guests, but we also have multiple computers for you to use free of charge in our lobby. We have a satellite television with Netflix in our common area, 32” LED TVs in our matrimonial rooms, and a variety of games and books for you to check out from reception. We are fortunate enough to have a beautiful Ecuadorian Restaurant as part of our hostel, offering a tasty local food with 10% of discount for all our guest. There are $5 dinners including a drink and free dessert if you sign up before 5. We are proud to offer a huge variety of GREAT Breakfast for an extra cost. You won’t go hungry staying here! You can socialize on our large sunny rooftop terrace, with a beautiful view of Baños and the waterfall. Here you can find some peace and quiet away from all the adventures. There's also a fully-equipped kitchen, free Internet, a movie collection and tons of activities organized by our staff. Staff are friendly, multi-lingual and know of all the best food and activities in Baños. They’ll be happy to help you make the most out of your stay. Once you stay with us, you are no longer just a guest... you're part of the Erupcion family! Loved staying here while in Baños! The hostel was nice, the staff are awesome, there’s a good restaurant attached, where guests get special deals, and a nice rooftop view of the town. I would definitely come again. OBI was an amazing host! He helped us book tours and was always Keen for good chats. We had a private room that was spacious and clean. They also provide clean drinking water and have $5 dinners available (they have a kitchen but it is shared with the restaurant so it's challenging to use). The location is right on the main square which is great for getting around but it does mean it's a bit noisy so bring some earplugs. Overall, we loved our stay at Eruption Art and will definitely stay again! Our bus got in late (1am) and they were very accommodating. The place is definitely older and a little more run down but I think that’s how all of Baños is. There’s an amazing restaurant in the hostel, they have free water in jugs and tea. 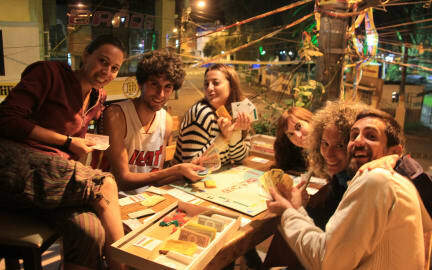 Also great events they do every day to meet other people in the hostel which is very cool. It’s in a great location by the park with tons of eating places nearby and shopping. For the price, you can’t beat this place. My friend and I shared a private double. Pretty good hostel in Baños. Was quite dead when we were there though. There was not hot water when I tried to take a shower (probably because they have a small water tank). Great view from their rooftop terrace! Privacy curtains for bunk beds which is always appreciated. Wifi works well. Security lockers in rooms plus even dorm rooms lock and you need a key to get in - feels very secure. All in all would recommend. Very comfortable stay here. Beds were very comfortable and the 4-bed dorm had its own, clean bathroom. The staff was super friendly and warm, the hostel is right in the center, and they offer organized activities and tourism services for their guests every day of the week. There was a restaurant on the first floor that combines with the hostel’s reception, and their kitchen was technically open to guest use during the day, but it wasn’t exactly a communal kitchen. We had a room with no windows, but the location was perfect in the central plaza, not too noisy at night. They had bins for luggage under the bunks, although my lock was too fat to fit and they didn't have any locks there. Comfortable beds with individual lights/outlets. Tight quarters if we hadn't been alone in the room (2 people in a 4 person room). Staff was pretty helpful and they have information on what to do in the area. It was not the best hostel I've ever stayed at, but it was good. We stayed in a "deluxe" 3-person room that was so small the bathroom door couldn't open fully because of the twin bed. The window in the room overlooked a construction site across the street, so there was a great deal of noise. The louvered window wouldn't close because they ran a coax cable through it. The staff was very friendly and helpful. They let us check out early and apologized that the room was listed as deluxe. Our stay at Erupcion Hostel was great. Ovi in the reception answered all our questions and was really helpful. We stayed in the 6 person dorm and it was fine. A bit noisy because of the Road right outside our window, but it didn't bother us much. The kitchen is also the kitchen of the restaurant in the hostel, so we didn't really use it. The fridge is also very full. Overall would recommend. Great location but that also means it's very loud since it's near a main square. Shower was horrible; no pressure at all. Good breakfast in the morning!